The creators of the Click! Colours are Greg Barnes and David Koutsoukis. 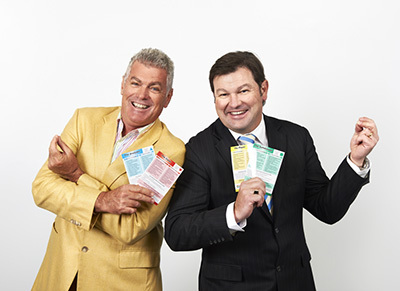 They first met at a National Speakers Association meeting in Perth in 2005 where they swapped books they had each written – Greg, ‘The Genie Within’ and David, the ‘Behaviour Management Toolkit’. It was here that they discovered a common interest in human behaviour and personality tools. They had both been running leadership and team development programs for many years and knew the value of understanding diversity and it’s many applications. Both had used many personality different models and were accredited in a number of different instruments. Greg then suggested “Why don’t we create a product and sell it to other facilitators to help pay for our lunches!” David agreed that it was a good idea. And so the Click! Colours were born. Not long after they were released, and without any promotion or marketing, they found that demand for their new tool was so high they couldn’t eat and drink the profits fast enough. It was then they decided they might need to get serious. At the time of developing the new tool David was listening to a Brian Tracy audio program. He heard something that captured his attention… “What businesses want is a ‘better, faster, cheaper or easier’ way of doing things.” This made perfect sense for developing the new tool and addressed some of the key limitations of existing instruments. So with ‘Better, Faster, Cheaper and Easier’ as their motto, David and Greg started to develop criteria for what was to become the Click! Colours. They examined dozens of different personality models and picked out what they considered to be the best features. Greg had also previously developed a tool called the Genie Cards that became starting point for the new product. There’s an old saying that goes “There’s nothing new under the sun, it’s all in the way it’s spun.” The next section reveals the philosophy behind the development of the Click! Colours and the criteria Greg and David used to ‘spin an old message in a new way’ to create a better, faster, cheaper and easier personality tool.